Because the traditional method of keeping tape backups offsite is often error-prone and cost prohibitive to scale, achieving near-zero data loss, retaining data for long periods of time, and complying with industry requirements is often difficult. 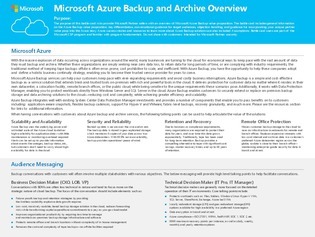 Download this compact sheet for an overview of an alternative recovery method: Microsoft Azure Backup and Archive. Included inside are the key differentiators of this solution, as well as 6 questions about Azure Backup data integrity, compliance, snapshot frequency, and more answered.